I haven't found links anywhere aside from the scalped Amazon ones. Supposedly some don't light up well, and others have bad cosmetics (ie eyebrows not painted, only one painted etc). Looked like you got a good one. I've also been told she is shipping dedicated (ie full box of 6). Glad you landed her...no need to deal with Target, lol. I'd like to get her in ASAP as she is who I record next in the Giant Upgrades vids. I've just been really busy since the internet connection got fixed, and then going out of town didn't help much either. 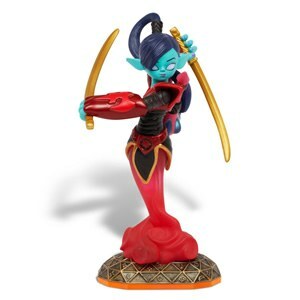 I called and my go-to GameStop is going to hold one for me if they get her in...I'm hoping they get a shipment tomorrow or Thurs for me! I just upgraded Ninjini and took her down Ancient Djinn Magic since Scarlet's swords are gold and that matches the last upgrade in Swords of Might...it is those little details, lol. Also upgraded Bouncer tonight...Went with the poll vote to determine it...both seem okay, but I wonder if Robot Rocketeer isn't better...Super Machine Fingerguns seemed to bump the damage from 7 to 8...I was expecting double :s Both seem fun though. Ninjini should be interesting to use with Dijinn Magic...I'll let Scarlet dictate Swords of Might!